Hope all is well with each of you in the Deer Park Class of 1963. 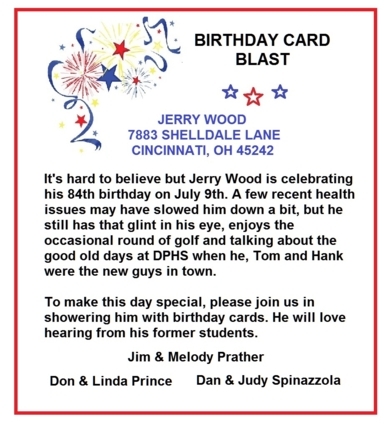 Here is an invitation for us to participate in celebrating one of Deer Park's legendary teachers and coaches in an upcoming birthday tributes. With the busy lives we have led since 1963 it is hard to believe we are about to celebrate our 50th year since graduation from Deer Pak high School. Do you remember June 5, 1963 as we stood on the football field and received our diplomas? It surely was just a few months ago....wasn't it? I remember our 25th Reunion when I said "we all grew up together so we are closer than to those with whom we went to college or those people we knew throughout our working careers". Think of your high school class as a "family". That is how the reunion committee feels. We have been reminiscing about our school days since we started meeting last September to plan for our 50th Reunion. It is important to your reunion committee that you attend this milestone event. We chose the weekend of October 4th and 5th. That is Deer Park's Homecoming weekend and our class will be recognized at the Friday night football game with Finneytown High School. 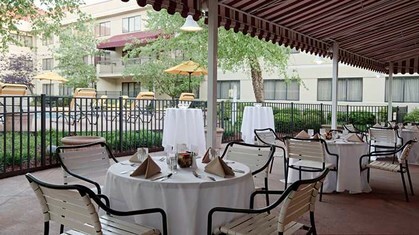 A great Saturday evening is planned at the DoubleTree Suites and we want you there. Please let us know as soon as possible if you can or cannot attend. We are going to have a "Greeting Board" to post messages from classmates who cannot make the weekend. Please refer to the Invitation Letter sent out earlier this year by opening the "Invitation Letter / Details" on the left hand column. We hope to hear from you that you will be coming to our 50th Reunion. Welcome to the Deer Park High Class Of 1963 website. 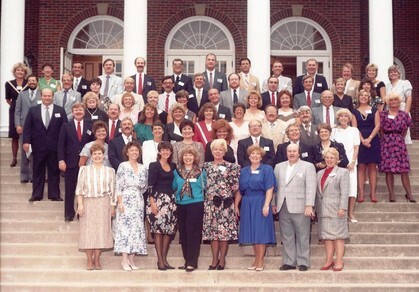 As our Class approaches its 50th Class Reunion, we are going to do our best to connect or re-connect with all who graduated with us. We will start with the information from previous reunions and ask all to help us search for "Missing Classmates." We will start by listing all those 1963 Deer Park graduates that were listed in the 1963 year book. Once contacted and have an activated "Profile" we will remove classmates from the "Missing" status. Preliminary thinking is that we might have a reunion weekend to coincide with the 2013 Deer Park Homecoming which would probably be late September or early October. We will use this Site to keep all up to date and look forward to help from all. 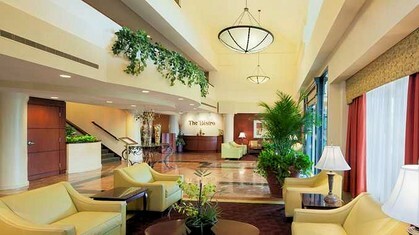 We have already had some classmates making their room reservations at the DoubleTree Suites for our reunion. 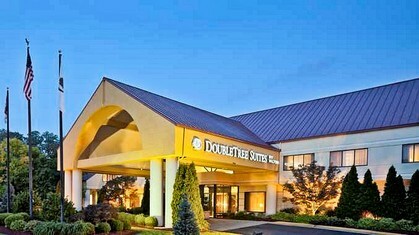 Individuals should call the DoubleTree switchboard at 513.489.3636 or 1.800.222.8733 and ask for the group name Deer Park Class of '63 Reunion to receive the group rate of $109 / night. 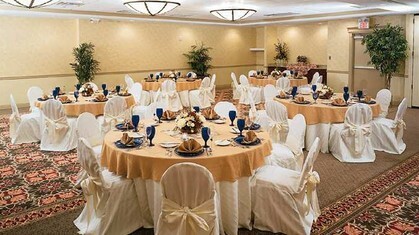 PLEASE MAKE NOTE THAT OUR REUNION EVENT WILL BE HELD AT THE DOUBLETREE SUITES BANQUET ROOM ON SATURDAY, OCTOBER 5, 2013 starting at 6 pm and running till 11 pm. You will be pleased with the facility as it is beautiful and the hospitality is outstanding. 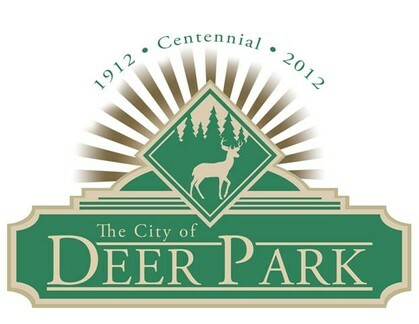 We will have events Friday night surrounding Deer Park's Homecoming. The football game will be with Finneytown and those who want to attend the game, we will have a designated area for the Class of '63. For those who want to skip the football game, we will suggest a restaurant where those who attend the game can join you later. We will keep posting things as they develop to keep you informed about the events of our upcoming reunion. Please remember we want everyone who attends our reunion to have a memorable time. This Class Creator Site will be our archive for years to come and please remember you can communicate with one another as often as you like. By pulling up a classmate profile you can share photos or old stories. If you find a picture of an old friend share it by posting it on the site. Do not forget to send "Birthday Greetings" to a classmate who has posted his/her profile. This site will only be as good as we make it. Visit it often and enjoy it for years to come. Please ask the questions you might have and we will try and answer in a timely manner. This is your reunion and we want to make it the best we can for everyone who was part of the Deer Park Class of 1963. Let's make our 50th Reunion the best ever! It is with sadness to tell you that Coach Tom Griswold passed away yesterday evening. Apparently complications had set in after he fell and broke a hip a couple weeks ago. There will be a memorial service in the gymnasium later in the week and I will post the details for those of you who are no longer local. He will be sorely missed as he has been extremely involved with Deer Park up until the time of his death. Thanks to the classmates who responded to the email about having a 70th Birthday Celebration on October 17th. It has been requested we try a different date so maybe we can increase the number who can attend. Many of you have quite a busy social calendar which is great! We are hoping that more can attend the dinner if held on Saturday, November 7th. Suggestions would be appreciated where we might hold it. Look forward to hearing from you. A small committee from the class is having a start up meeting this coming week to kick off the planning for our upcoming 50th reunion in 2013. Anyone who would like to participate is more than welcome to join the committee. We hope by having a website that we will be able to create enthusiasm, get everyone connected and invite all to attend our 50th Class Reunion. Just cleaning up some files and took a look at our Web Site for the 40th in 2003. We should take a look at it as we develop our plans for the big 50th.